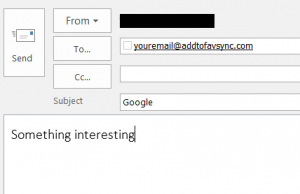 This post explains the FavSync Chrome extension / add-on user data privacy. - Read and change all your data on the website you visit - This permission is required for the password manager functionality. This way FavSync add-on can input the login data directly into the currently opened phone tracker website. - Read and change all your browsing history - This permission is required for importing your most visited websites into the FavSync New Tab. - Display notifications - This permission is required for various functionality. - Read and change your bookmarks - This permission is required for importing the bookmarks from your sms tracker. - Manage your apps, extensions and themes - This permission is required to access the APPS in your FavSync New Tab. Note: these permissions are required ONLY for the functionality mentioned above. FavSync will not abuse, resell or store on its servers any of the information for any other purpose. Unfortunately, the permissions the add-on requires are sometimes too general. Example: just to import the most visited websites into your FavSync New Tab, the add-on needs to ask a permission to read and change all the browsing history, even though changing the history is never necessary. If you are browsing the web and come across a huge chunk of text with links in it that you would like to import, you can do it with FavSync in no time. Use the Import from copy/paste option to extract links from a text easily. Open Account Settings, scroll to IMPORT FROM COPY/PASTE and click on Upload Text. Afterwards, paste the text and click on Preview. 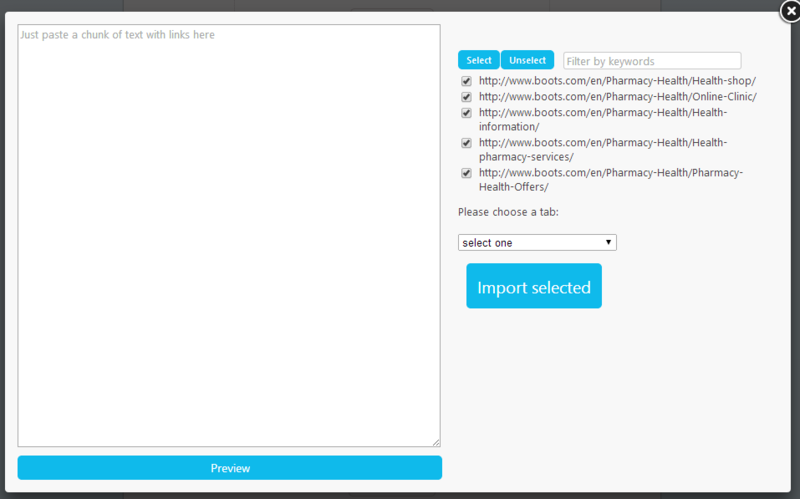 Choose the links that you would like to import and the tab where it will be imported and click on Import. 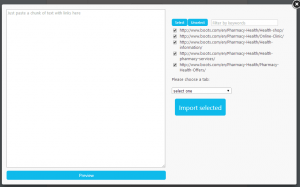 The links will be created as bookmarks in the Import from copy/paste category. The Filter keywords option will help you importing only the relevant links.